Become a Yoga Teacher in 2017!! The Barkan Method Hot Yoga Teacher Training at The Original Hot Yoga Center in Voorhees, New Jersey! This training will take place over two ten day periods. September 13-23 & October 19-28 2017! Teaching yoga teachers is something we can not take for granted. It is a responsibility that can not be taken lightly. There are too many teacher trainings programs out today lead by instructors with limited experience. This is what sets The Barkan Method apart. Jimmy has been practicing since 1980, was the only teacher allowed to certify Bikram Yoga Teachers besides Bikram! 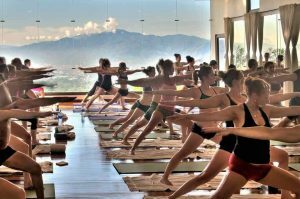 Jimmy started his own style of Hot Yoga called The Barkan Method back in 2002 and began his very own teacher training program after 22 years of teaching! Barkan has lead over 30 Level I and over 25 Level II/III teacher trainings with well over 1500 graduates who are now teaching all across the world: Australia, New Zealand, China, Japan, Thailand, Hungary, Vienna, Switzerland, France, England, Iceland, Norway, South America, Costa Rica and of course all across the United States!